Skin stuff. I get so many emails on this topic that I figured it was time to address it in a blog post. It took me a while to finally sit down to write this post because skin “issues” are so multi-factorial that it’s certainly no one-size-fits-all and I was finding it difficult to write a post that would be helpful for anyone reading. Essentially it was hard to write a general post about something so individual. 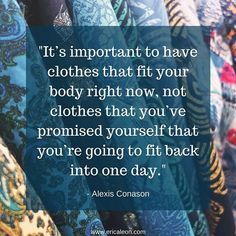 I think it’s important to first realize that just like the pursuit of a flawless body would take extreme measures and you likely would always be chasing after fixing flaws, the same goes for skin. The beauty and cosmetic industries lead us to believe flawless skin is what we all desire. The more we talk about flawless skin, the more I see the parallels between how we view our bodies and how we view our skin. In the same manner we are lead to believe by the diet industry that something is always wrong with our bodies, we are often led to believe there is something wrong with our skin and therefore it needs fixing. I say all that as a preface to this post. Because while yes, there will be medical conditions that affect your skin and your skin can gently tell you, “hey self, we need paid attention to….something is a little off.” – this idea of flawless skin can lead to a lot of unmet expectations and frustration…just like the idea of a certain body size. I think it’s important to remember and process through that. With that said, I do believe there are some things our skin helps communicate to us. Just like our bodies can help communicate to us when it needs more or less of something. So what causes skin changes? Although there is still a lot of uncertainly in the literature between when you consider acne to be adult vs adolescent, adult female acne has traditionally been defined as acne in women 25 years old or older. I define that a bit because the etiology of adult vs adolescent skin issues can be different. Sebum production – the oily, waxy stuff produced by your sebaceous glands in your skin that clogs your pores. Growth of bacteria called Propionibacterium acnes – this bacteria lives in your hair follicles and when those pores become blocked, the bacteria multiply and contribute to acne. While these are traditional causes that are established in the literature, and while these are likely involved in skin issues as we go from adolescent to adult women, the specific factors that lead to a new onset or recurrence of acne and skin issues as we transition into womanhood actually aren’t very clear in the research from what I’ve found. But hormonal fluctuations and genetics seems to play a key role. I think it’s important to remember when somebody says, “hormonal acne” that really all acne is mediated by hormones. When you get your first pimples as a teenager, that’s due to an increase in androgen production during puberty which causes the increase in sebum production. And the other three reasons listed above are hormonally mediated. 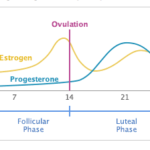 So I think a better way to think about “hormonal acne” when we talk about acne that surfaces as we enter adulthood as women is “menstrual acne.” Because really, it’s the monthly hormone fluctuations throughout our menstrual cycles that are likely the key players in skin changes. 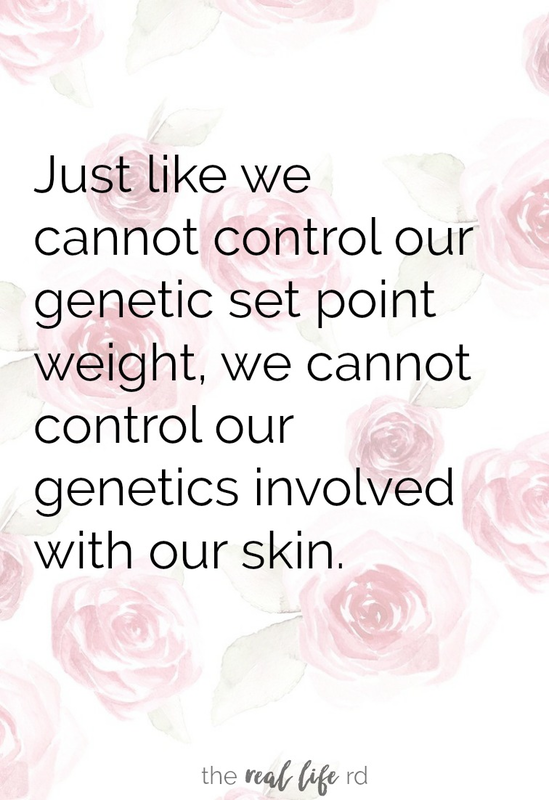 Even more important is realizing that just like we cannot control our genetic set point weight, we cannot control our genetics involved with our skin. It is what it is. There are things we cannot change and that is okay. I don’t think we realize how much of our skin appearance is actually out of our control. Example. I have more wrinkles on my face that you average 28 year old. There isn’t judgment there (I’ve had to work on it..) but it’s an observation I’ve made. Then I realized I’ve had wrinkles around my eyes since I was like 10. This is part of my genetics. Can I moisturize and take care of my skin with SPF etc…sure. But I will always have these wrinkles and that is okay. I call them my laugh lines. As a culture, I think we hyper focus on skin’s appearance, how old we look compared to our actual age, how many skin spots and wrinkles and pimples and freckles and moles we have. I could go on and on and on. 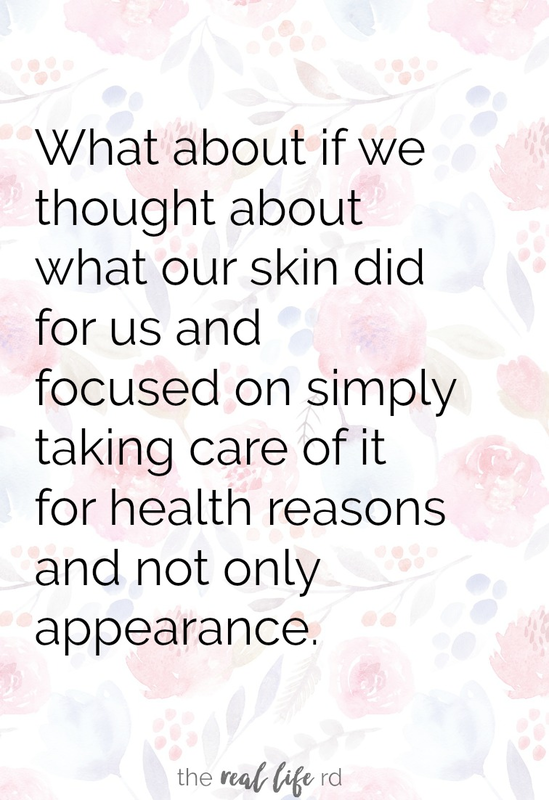 What if we thought about what our skin did for us and focused on simply taking care of it for health reasons and not solely appearance? Your skin regulates your body temperature, protects you from toxic substances and harmful effects of the sun/radiation, excretes toxic substances through your sweat and keeps everything all tucked inside of your body. Your skin does so much for you! 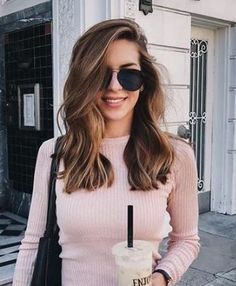 So instead of focusing so much on the minutia of you skin – getting rid of that pimple here or softening that wrinkle there, I think the more important thing is doing a little self evaluation of how you are caring for yourself – yes physically with nourishment and healthy movement and adequate sleep, but also mentally and emotionally with self care and stress reduction. 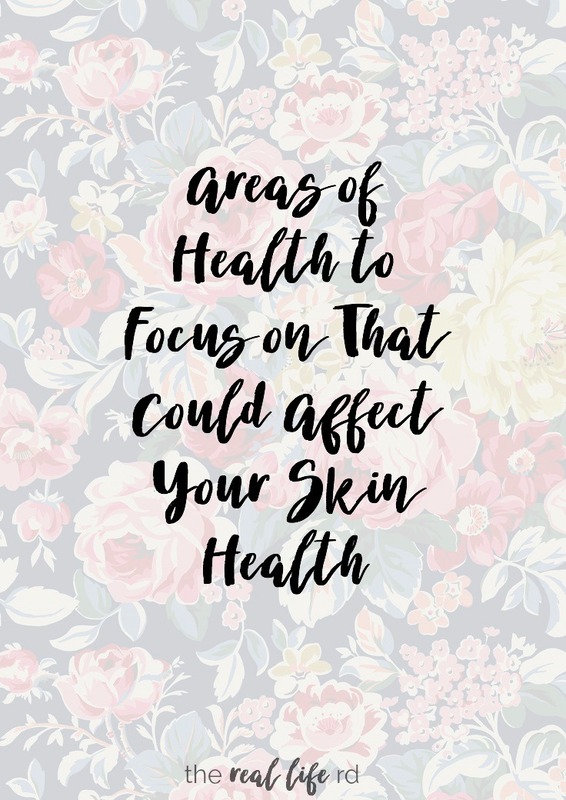 Focusing on those things affects skin health because it helps normalize cortisol levels – high cortisol throws your chemical and hormonal balance off. And focusing on those things helps keep the hormonal fluctuations during your menstrual cycle smoother (which cortisol plays a role in too) and less like a pendulum swing. Lastly, part of skin health is wearing sunscreen and putting nourishing products on your skin – I think that’s important to note too. And this isn’t a quick fix. Figuring out how to best care for yourself in all realms of health is a long process, but one that is well worth it. Is the physical activity you’re doing adding more stress to your life? Is is actually helping you de-stress or is it temporarily numbing you out from stress? Remember that moderate to high intensity movement (anything where you can’t sing the whole time) increases cortisol levels. 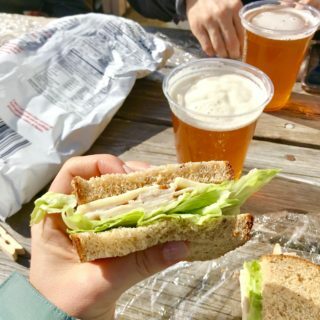 But also remember it’s about the totality of your life – if you do higher intensity movement, balance that with rest and recovery, make sure you’re eating adequately and taking care of yourself. I can’t stress the importance of good sleep enough. Get at least 7 hours a night, but ideally 8 hours. This is a big part of self care, putting yourself to bed at a time that allows you to get enough sleep. Research tells us that insufficient sleep raises cortisol levels and causes insulin resistance which affects your blood sugar control. Maybe creating a bed time routine is part of self care for yourself? Maybe ideally you’d like to make a cup of tea and read for 30 minutes an hour before bed. Then do some stretches, brush your teeth and wash your face (or whatever you do for hygiene) and crawl into bed without your phone or any electronics. Start with slow changes each week until you get into a rhythm of care for yourself around bedtime. How do you care for yourself? Maybe you don’t or have thought about it. Maybe you need to take some time and space to reflect on areas of your life that aren’t a priority, but you’re still investing time and energy into. What are some areas you can set boundaries around to better care for yourself? I think Kylie’s self care box and blanket are great ideas to get you started with this process. Most importantly, my inner nurse is coming out and telling you to wear at least SPF 30 if you’re going to be out the sun for more than 10 minutes. That’s black and white and something I highly recommend 🙂 But also I think it’s important to put things on your skin that help you and your skin feel it’s best. Everyone has different skin needs – some people have dry or oily or sensitive skin – but I do think it’s important to cleanse and moisturize and care for your skin. And that doesn’t have to cost your entire paycheck. I have been using the Body Merry line that I order off Amazon for over a year now and really like it. I’ve found that starting with the cleanser, then toner, then rubbing on serum and finishing with moisturizer works well and takes all of 60 seconds. The products last me 6-12 months too. That’s just what works for me, find what works for you and your skin. Skin care is so multifactorial and remember time and time again, genetics play a role. It’s okay to be frustrated at that pimple or wrinkle or red spot while also making space to be gentle and compassionate with yourself. Your skin is more than just appearance, it does so much for us. And I think if we focus on taking care of ourselves as a whole, our skin will be taken care of too. For health reasons and not simply appearance. I’ve been slowly coming to terms with the fact that my skin issues aren’t a sign that I’m doing something wrong or need to change something major, but are just part of my genetics. That being said, I definitely think there are many products and habits (like the ones you mentioned) that can actually make a tremendous difference. Just important to remember that miracle products don’t exist and perfection is not reality. I’ve always had acne for genetic reasons, so my skin (and its appearance) has been a big issue in my life. “There are things we cannot change and that is okay”. That’s it! On a related topic, I would be interested in hearing your views on sugar in general. You hear all kinds of fear mongering about how sugar causes skin problems, digestive problems, the catch-all “inflammation” but it is a fact that there are more added sugars in foods than ever before, and we have higher instances of certain health problems. I am someone who really enjoys sweets and has no interest in cutting them out. That said, I am not sure where or how much I need to moderate my consumption because there are so many different opinions out there. 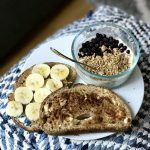 I love your approach to food and nutrition and would be so interested in reading on post on this subject. Love this comment of yours Cate! I try to approach it more with curiosity than judgment. I’ll write down the topic of sugar to address! Thank you for continuing to write such USEFUL POSTS that address the bio-psycho-social model! When I moved to my current town 3 years ago, my skin broke out uncontrollably. I suspect that part of it was: I switched to a different brand of Oral Contraceptive. However, I was stressed out, working long hours, and depressed. Once I switched jobs, Oral contraceptives, and entered a nourishing relationship, my acne calmed down. Today, I probably eat more gluten and sugar than I did previously. I break out from time- to- time, but you can see my face rather than a red hot blistery mess. Lack of sleep makes people break out and gain weight! Thanks for this post! I love all your writing. I was wondering what type of sunscreen you recommend for face/body to wear year round that doesn’t smell so much like the sunscreen you wear at the beach? Hi Alyssa! I don’t have a particular favorite but usually buy whatever organic brand is affordable and has good reviews on Amazon! Love this post! I do think it’s important to not refer to it strictly as “menstrual acne”. 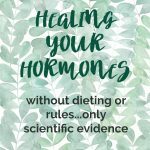 I suffer from Hypothalamic amenorrhea (for the past 5.5 years) and have random “surges” of acne, that don’t seem to mimic any menstrual cycle but is clearly hormonally induced.. I recently consulted my derm as it became unmanageable (large, painful cysts primarily on my jawline, chin, and neck). She explained that for hormonal imbalanced acne topical remedies are not going to have much of an impact. I started spironolactone, which has a secondary use for hormonal acne as e it blocks androgen. I am carefully monitoring it with my derm and my reproductive endocrinologist. It’s only been a month or so but I am already seeing the effects. Thanks for adding skin care to your awesome array of topics you cover! 100% agree with you. All acne is hormonally induced. An overproduction of androgens is a key underlying cause of acne and figuring out the cause of that overproduction helps the healing process. Thank you for reading Angelina! Thank you for this post Robyn! I have never looked at fixing my skin as something similar to how we try to “fix” our bodies and really appreciate that perspective. I do have a question: when I was in the depths of anorexia I never suffered from any skin problems; now that I am well on my way to recovery I have craaaaazy painful cystic acne break outs – It is so hard to see this because there are SO many motivating things about recovery and I would never trade this new mindset i’m forming around food and my body for the world, but It almost seems like recovery and acne are correlated…is my body just finally producing hormones etc. which lead to acne? 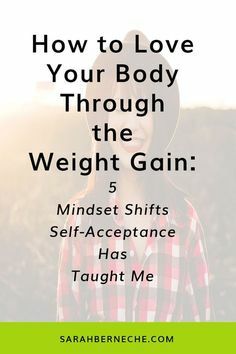 How can I keep motivated on a recovery process when It seems like with every 2 steps I take towards a healthier body image & self image, I take 10 steps back with my skin? I feel like multiple step skincare routines are super popular nowadays, but I honestly think that a “less is more” approach works for me. When I had hormonal acne, I kept trying new things in hopes that this next new product would completely heal my skin. Since getting off of hormonal birth control my skin has definitely regulated, but simply using a serum/moisturizer instead of soooo many steps we sometimes see nowadays (I recently saw a youtube for a 10-step routine!!) really helped my skin calm down. Great post! love your input here Meghan – yes sometimes LESS is best! Thanks for a great post. It makes sense that to me that diet and other lifestyle choices are only part of what determines what our skin looks like and how it changes over the course of a lifetime. I’m 39 and was a heavy smoker from the age of 13 to 30 and drank a LOT throughout my teens and 20s (and also worked 60-70 hour weeks and slept very little) but I have literally no wrinkles, and people constantly mistake me for being in my mid-to-late 20s. This really frustrates me, and even more so when people tell me it’s a compliment. I loathe our society’s fixation with appearance and the prevailing norm that youth = beauty, that women especially should “fight the aging process” etc. Aging, growing older, is a wonderful thing. We gain life experience, perspective, knowledge, humility (well, hopefully we do!). I don’t want people to think I’m 25, to me that erases the almost 15 years of experiences and knowledge I’ve gained since then. And thank you for explicitly linking our preoccupation with “prefect” skin to the equally (or even more so) harmful preoccupation with the “perfect” body. It’s so important to highlight that the diet and beauty industries go hand in hand, that they are different manifestations of the same thing. I’ve been reading your blog for a couple of months now, and I am so grateful for it. You’re providing an incredible public service. I’m just wondering about one thing – you seem to critique the diet and fitness industries quite a bit, as do a few other health blogs out there, but I never see this kind of critique placed in the context of our wider socio-economic structures, i.e. neoliberal capitalism. What drives these industries is profit – in a nutshell, they are enabled and driven by the capitalist system, or, to be more precise, consumer capitalism, where the cycle starts and ends with money (money is invested to produce a product that is then sold for profit, and so the circle continues), and which is today underpinned by neoliberal ideology which dictates that it is up to each individual to “fix” themselves and their situation (as opposed to communities working together to solve problems that cause individual distress – and i don’t mean on a voluntary, “charity” basis but organised solidarity, creating different social structures that enable all of us, as a society, to care for each other). I think that, in a longterm sense, it’s going to be difficult to successfully challenge and overturn current harmful norms propagated by the beauty, health, and fitness industries if we don’t acknowledge the underlying system that drives these things. That’s my view anyway. Thanks so much for your comment and for sharing your skin experience. I think that is so helpful for others to hear and further “evidence” of how genetics play a role and how complimenting someone on how they look younger than they are sometimes isn’t the compliment it might be intended as. I 100% agree with you that we won’t be able to create true, lasting change without identifying and then overturning the underlying system. 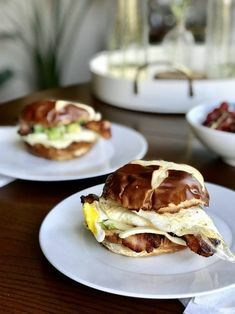 Creating different social structures that enable all of us, as a society, to care for each other is key I think and while I can’t as one person do that, I do think there is a lot of power in community and the resistance of engaging in diet culture and/or buying products that provide that profit. There is natural critique of the diet and fitness industry here that is unavoidable I think because in order to promote a message that goes against diet culture you have to ultimately disagree with the diet culture itself. I hope I’m understanding you right? I agree with what you’re saying, I think I’m just trying to understand the question you’re asking…or maybe it’s just a good point you’re making? 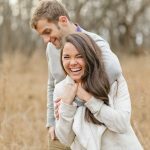 Thanks for reading and welcome to the blog!! I love this post, so helpful as I feel like I’ve always struggled with my skin for different reasons. I also just love the fact that there’s more posts per week now! Nothing makes my day quite like finishing a night shift and seeing there’s a blog post up I get to read before bed! ❤ Curious about what kind of sunscreen you use! Or does one of the Body Merry products contain sunscreen? 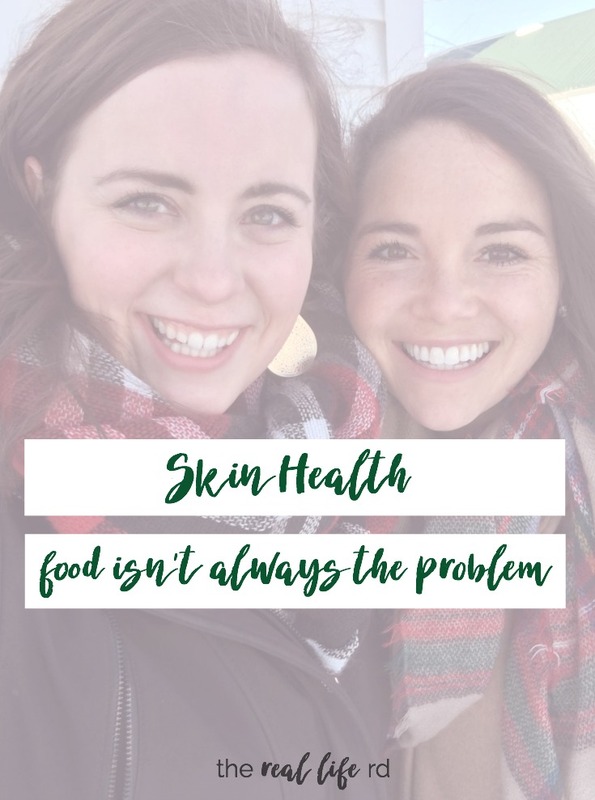 I love this post, because I work for a company that sells skin care products, and I feel like whenever someone talks about a skin issue they blame it on inflammatory foods (gluten, sugar, etc.). 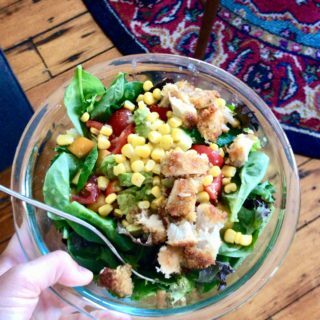 I love your balanced perspective, and it encourages me to keep standing firm to a non-diet approach to life! Thank you! Yay for skin love! I’ve been working on this for a long time.. I’ve had problem skin all my life, with acne and rosacea that no doctor could solve. I’m finally on antibiotics which control the inflammation (though I’d like to get off the AB..) but I’m happy. I too have some wrinkles on my forehead (I’m 25), and a big mole right in the middle of my forehead hahaha. But I love it! It’s me. My best skin is when I’m outside hiking, enjoying nature, drinking water, laughing, and loving life. Basically, when I’m out doing things and not worrying about it. It seems like the more I worry about my skin, the worse it gets, but it manages to fix itself when I leave it alone and focus on life-fulfilling things instead. Go figure! This attitude is actually how I approach mindful eating too now. thank you so much for sharing Alexandra! I so agree on the worry part and focusing on living your valuable life! This is the most helpful post I’ve ever read about acne, and I’ve suffered from it for three years now (as an adult). The parallel you draw between having “perfect” skin and having a “perfect” body is like a wake-up call for me that I’ve never really considered before: I long ago accepted the fact that the perfect body does not exist, yet I’m convinced that perfect skin does. I stopped trying to control my body a long time ago, but here I am doing it to my skin! I’ve spent HOURS reading up on all the minutiae that could possibly help with it, from testing the pH balance of products to supplementing with x, y and z based on non-conclusive evidence from tiny studies, and trying all sorts of miserable “acne diets”, all the while causing myself more stress and likely aggravating the problem. THANK YOU so much for this post. I needed to hear it, and I think a lot of other people could benefit from it too. 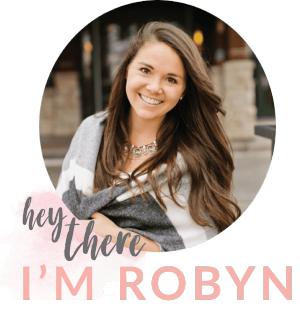 Hi ROBYN, this information helps me a lot to get rid of this skin problem and I have been very thankful to you for providing this solution. Keep updating thankyou.